Ah good blackjack- are you on for a round? 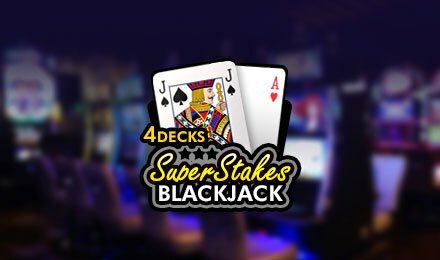 You can join the table of Super Stakes Blackjack at Vegas Spins. Developed by Section 8, this card game comes with various options such as personalised settings of sounds, table colour and modes. Personalise the game as you like and enjoy a good gaming experience. Join the table, place your stake and try to bust the dealer. You better be quicker than the dealer, to get a hand of 21. For the game to start, you first have to place your bet. Throughout the game, the dealer uses 4 decks of cards, which are shuffled after each game round. After your stake has been placed, you just have to click on ‘Deal’ to get your cards. You can win top prizes and it all depends on the cards you hold. Bet Levels: Bet Levels are not available on this game. Amount of Paylines Selection: This game is played on a blackjack table and does not consist of paylines. Coin Values: You can choose chips which are valued at 1 to 500. By clicking on the chips, the bet will appear on the table. You can click on ‘Clear’ to delete the chips off the table. You can bet a minimum of £10 up to a maximum of £3,000.